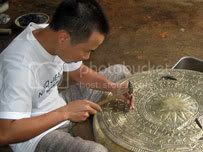 A farmer in Vietnam is steadily gaining a reputation for recreating the famous Dong Son style bronze drums, found ubiquitously all over Southeast Asia from 500 BCE. Farmer-turned-artisan Thieu Quang Tungâ€™s bronze drums, created in the image of ancient masterworks, have become the toast of historians and artists alike. Vietnamese bronze drums date back to the times before Christ and the first Dong Son bronze drum â€“ the ancient relicâ€™s most famous model â€“ was excavated over 80 years ago. Read about Farmer Tung’s bronze drums here.